Today . . . . . because Thanksgiving is exactly one week away and because I just cut 10 inches off my hair and I might start crying and because we could all use a sweet pick me up. . . . I am posting this delicious creation for you! I was sitting here the other day flipping through some frosting recipes that I had saved. I was looking at this recipe from Mel's Kitchen Cafe and had an AMAZING idea pop in my head. Why not use eggnog instead of milk and make an eggnog frosting????? I LOVE eggnog and could drink carton after carton if I would let myself. I have seen eggnog frosting recipes before, but they just make a regular butter and powdered sugar frosting and then add a tablespoon or two of eggnog. That was not going to cut it for me - I wanted serious eggnog flavor! 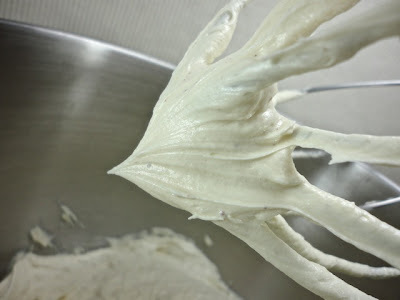 So, I started my experiment with this frosting. It turned out SO GOOD! It is light and fluffy like whipped cream and has a really good eggnog flavor. If you like eggnog, there is no way that you wouldn't love this frosting. I spread this over some soft sugar cookies and I haven't been able to stop eating them. Click here for the sugar cookie recipe! Oh my gosh, eggnog frosting...BRILLIANT! I am SO gonna make this!! So. Freakin. Awesome! Pinning and stumbling! @Robin and Dorothy - Thanks so much - You will love this if you try it! Oh my goodness.... I could chug a gallon of eggnog easily. Love, love, love the stuff! Will definitely be giving this wonderful recipe a try! You cut 10 inches off of your hair!?!!! I want to see it. I love egg nog!! I bet this would taste fantastic on some tres leches. I love your blog. I'm your newest follower. What a brilliant idea for a holiday cake! We've had Eggnog at our local grocery store since the beginning of September (I KNOW, RIGHT?) and I actually had to forbid my boyfriend from buying any until closer to Christmas because if its in the house, I will drink it without stopping. I have no self control around eggnog. So this frosting seems perfect for cookies on my cookie platter for Christmas.... and also for my mouth via a spoon. I'm not a big fan of eggnog but my husband is and while I'm the sweet lover he's the savory lover. This recipe just might flip him over to the sweet side. Ohhhhh wow this looks good. I think my family would love this for Christmas time! Thanks for sharing!! Eggnog? Seriously, I think that is the most brilliant variation of this recipe I've seen. My husband is.going.to.die. what a great idea!!! I can not WAIT to try this...tis the season, after all:) Thanks for sharing!! this sounds like my kind of frosting. I made molasses cookies and sandwiched this inbetween them. A.m.a.z.i.ng. 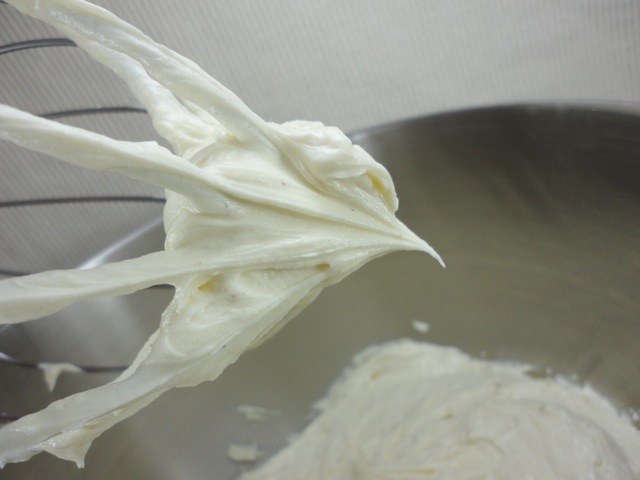 I just finished making the Whipped Eggnog Frosting. I was able to make the recipe as you have written on your web page. The recipes works great as you have directed. I am however, not satisfied with the results. The finished product is like eating sweetened, eggnog flavored, whipped butter. Definitely TOO MUCH BUTTER, for me anyway. Fortunately I cooked two batches of the eggnog mixture, as I was already planning on making two batches of frosting. I mixed the finished batch of frosting into the second batch of mixture. I DID NOT add any more butter. All ingredients mixed together properly, and now I have a great whipped eggnog frosting that doesn't give me the impression I'm eating whipped eggnog flavored butter. Thank you for posting the recipe. This frosting recipe is a great alternative to the usual frosting recipes made with confectioners sugar,which are way too sweet. Friday December 15th is National Cupcake Day. I will be making Eggnog Cupcakes, with whipped eggnog frosting to celebrate the day.